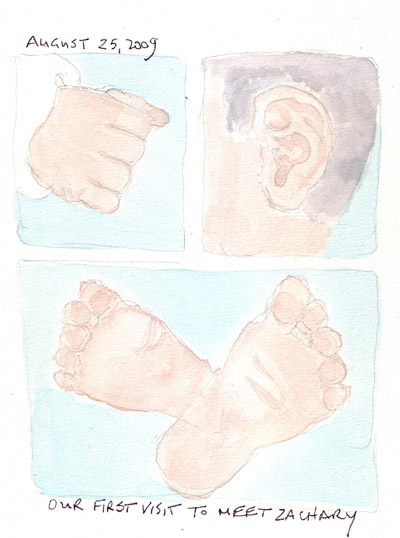 I took a few photos when we visited Zachary in the hospital and used them as references for these paintings. It will be fun to see when my figure sketching skills have improved to the point where I can sketch him better. So far I sketch my grandchildren from the back because I can't capture their facial features. Zachary's Baby Quilt: My daughter-in-law brought me nursery crib linens when she finally found some that she liked. 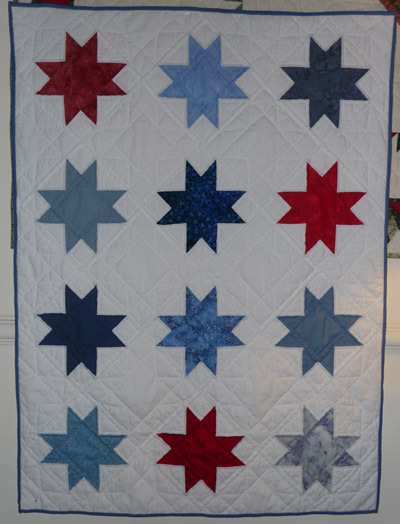 We decided that I would use a star pattern, like I did for Zach's big brother Robbie's baby quilt. Robbie's quilt was yellow and blue with an all over star pattern. 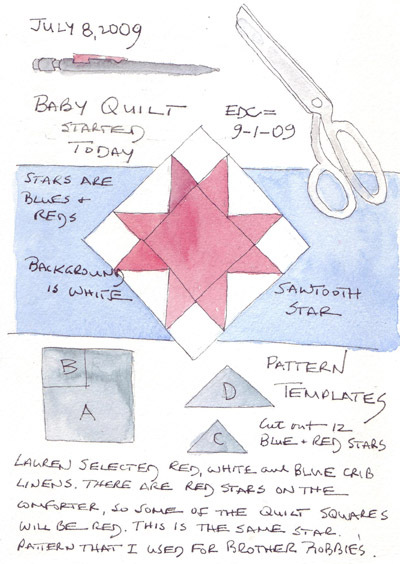 I selected fabrics from my collection, including 3 fabrics that were in his parent's wedding quilt and Robbie's baby quilt. I love the continuity and did the same for my daughter's wedding quilt and baby quilts for her 3 children. 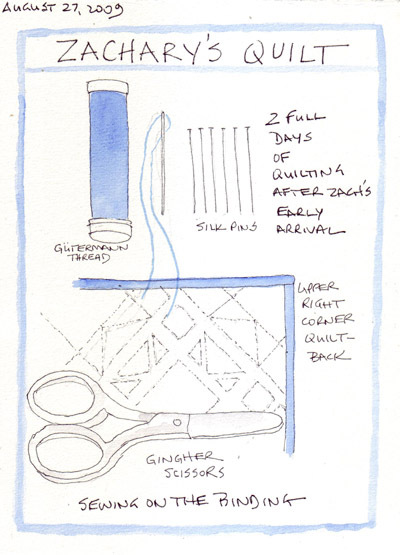 This was my journal page for the day when I planned the quilt and started the process. Racing to the Finish: I needed to speed up the quilting when Zachary arrived one week early, and spent two full days finishing the quilting of the border triangles and attaching the binding. It is hard to speed up the hand quilting process, it just requires marathon quilting sessions for me while watching old movies on TV! The Finished Quilt: I delivered this quilt to my son and his new son Zachary yesterday and it looks wonderful in the baby nursery! I always feel as if I am wrapping up each and every grandchild in my love - in ways that just add to our bonds. Annabelle and her parents just arrived from Washington, DC to meet her new cousin. She is too young to realize that she is not the family baby any longer! In Manhattan apartments, there are whole organizational systems created for under bed storage. But we've resisted so far and I have only 2 items under our bed. My First Briefcase: I bought this brown leather briefcase at Frost Brothers department store in San Antonio Texas in the late 70s and used it for many years while traveling back and forth to the Hospital. 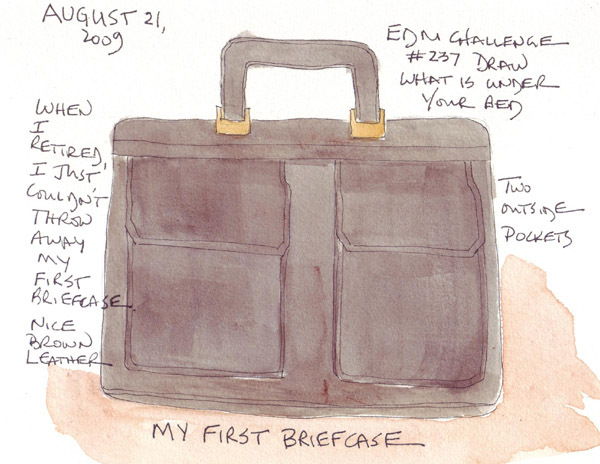 When we moved to New York City in the early 90s, I found that a large leather bookbag with shoulder straps made it easier to walk between our apartment and my car, so my briefcase remained in my office 99% of the time. When I retired in July I almost gave it away. This was a great opportunity to create a memory drawing. For now it will remain under our bed in a storage container. 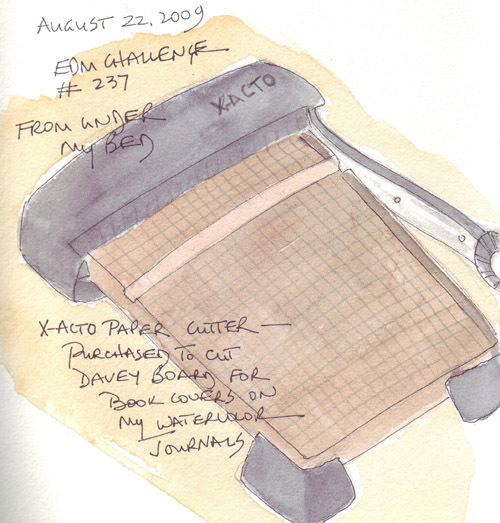 My New Papercutter: When I took a bookbinding class last year I worried about my ability to cut Davey board at home without the wonderful commercial papercutter that was in the Studio. I traveled around our neighborhood - from places like Kinkos to Staples - trying out their copy center papercutters on my sample of the book board. This X-acto paper cutter was the winner. I have used it to cleanly cut book boards for 10 watercolor journals and keep it under the bed in its original box for safety and storage. We lived in San Antonio, Texas for 18 years before returning to the Northeast and New York City and one of our very favorite dishes was green chicken enchiladas. 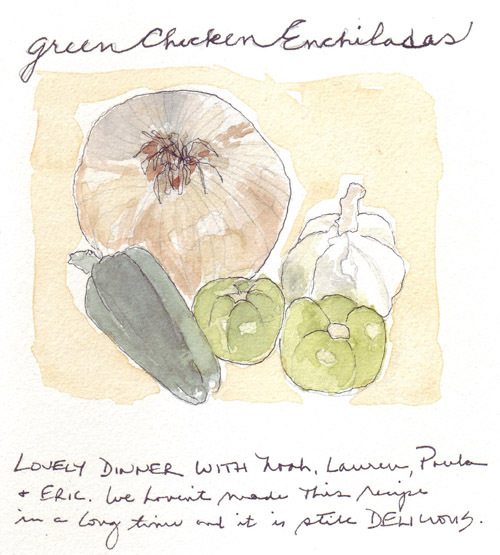 We had friends and family here for dinner last evening and before I started cooking, I sketched and painted the main ingredients for the sauce: tomatillas, onion, garlic, and jalapenos. I realized that I had never included any information about my dear friend Paula Nadelstern's current Art Quilt exhibit at the Folk Art Museum as she and I were talking during dinner. The EveryDay Matters art group has many art quilters and this morning I decided to add links to her fabulous work for them to see. Paula's website has a link to her current museum exhibit - and a gallery section with photos of many of the art quilts that are all based on kaleidoscopes. For those close enough to NYC, the exhibit also contains kaleidoscopes from some of the major artists for you to see. 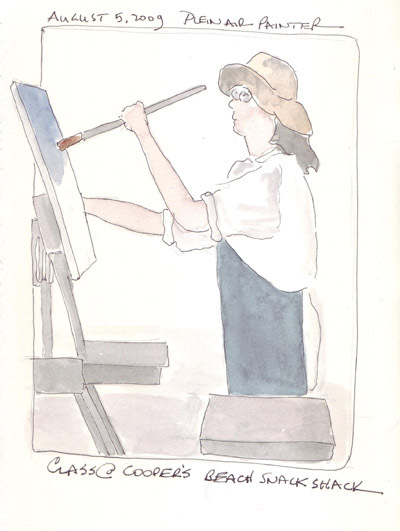 I joined the Central Park Sketching and Art Meetup Group this Spring and finally attended my second session. Although they usually meet monthly in Central Park, today's session was held at the newly renovated Washington Square Park in Greenwich Village. 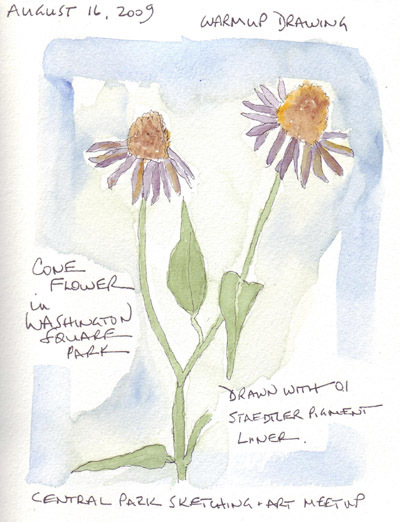 I arrived a few minutes early and did a quick warm-up sketch of cone flowers in one of the many flower beds in the Park I sketched it in pen, took a photo, and painted it at home this evening. It was a very hot day in the City and for the first 30 minute drawing session I sat on the ground in the shade under Washington's Arch and sketched. 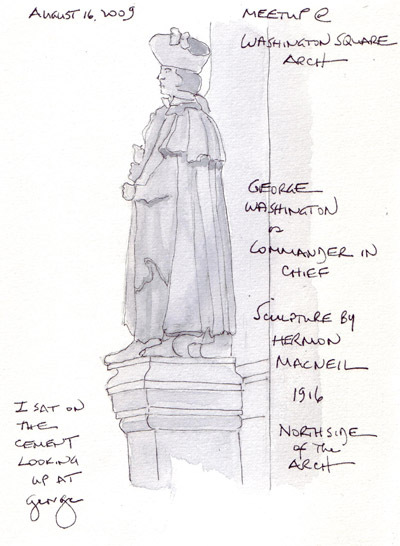 The first sketch is of George Washington as Commander-in-Chief of the Army - one of two statues on the north side of the Arch. The Park and the Arch underwent major renovation (2007-09). This was my first visit since the Arch scaffolding was taken down. 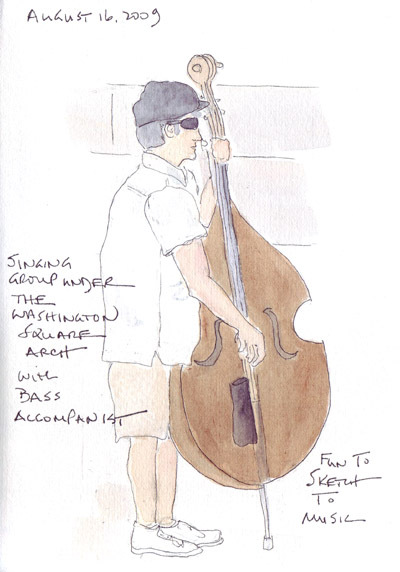 While I was sketching George, a 4 man doo-wop singing group began performing with a bass accompanist and I had just enough time to do another sketch. 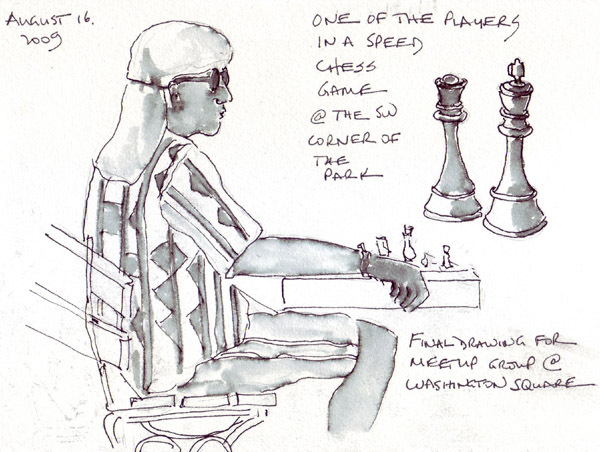 During the second 30 minute sketch I went off to find the Speed Chess players that are usually playing at the Southwest corner of the Park. I was immediately attracted to one in a geometic black and white printed shirt with a white scarf on his head. I did the drawing with my Pilot Varsity Pen and then spread the ink around the drawing with a Niji waterbrush. The group will meet again in two weeks at the Conservatory Water (Central Park at 72nd St entrance). 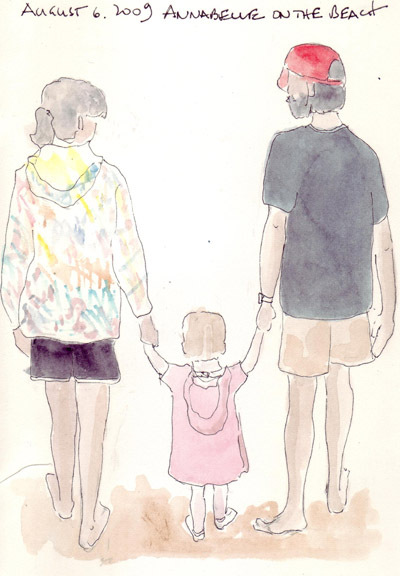 I finally added watercolor to the remaining drawings from our recent beach visit with Annabelle. 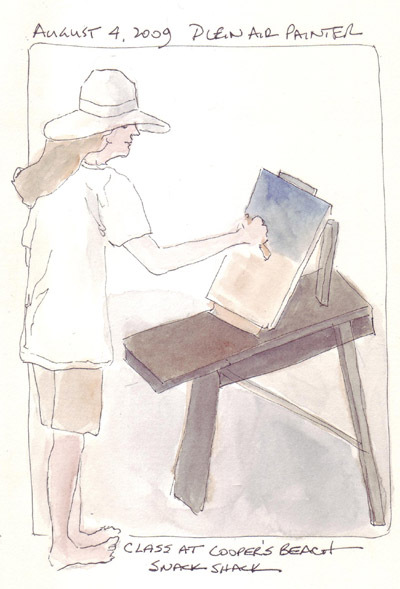 Early one morning, when we were finishing our beach walk, a plein air painting class was just beginning on the deck of the Snack Shack at Cooper's Beach. Most appeared to be oil painters. I watched them for several minutes, then took pictures and used the photos to recreate the images.